Slaven Bilic has been sacked by West Ham following their poor start to the new season. The Hammers have won only two of their opening 11 Premier League matches and were defeated 4-1 at home by Liverpool on Saturday . That defeat has left them in 18th place and Bilic, whose position had come under review twice already this season, has now paid the price for their slow start. 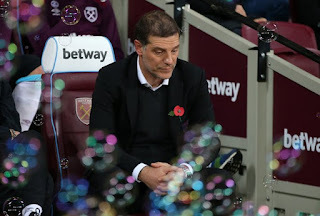 Assistants Nikola Jurcevic, Edin Terzic, Julian Dicks and Miljenko Rak have also left the club with immediate effect, West Ham confirmed in a brief statement which said a new appointment was "expected to be made over the coming days". A statement from owners David Gold and David Sullivan read: "During the summer, the board invested heavily signing the players Slaven believed would complete the squad he needed to push the Club back towards the level we had reached in his first season, and we believe we have the players capable of doing that. Report has it that former Manchester United and Everton coach, David Moyes may be his replacement.